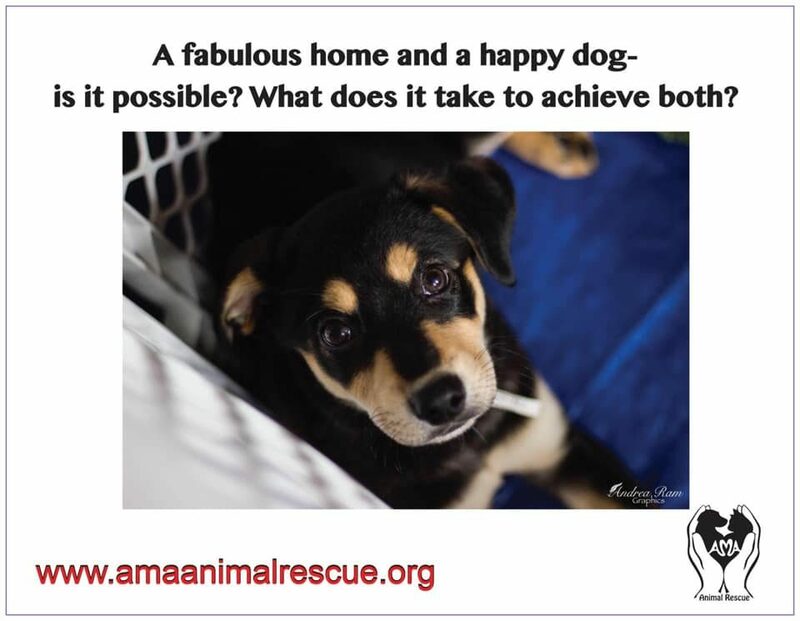 Having a dog and a breathtakingly gorgeous home are usually not two statements that most people pair together. Being a dog owner generally means dog hair everywhere, mud on the floor or even destroyed property at times. 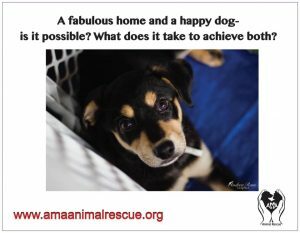 While each dog and its needs are different, it is possible to have a beautifully kept home. Here are a few ways to help you maintain a lovely looking residence and keep your pooch content at the same time. Dogs can be messy just like anyone else. Why not consider creating a space that’s only for your dog? A dog-only zone should consist of comfort toys, as well as a cozy bed and a few blankets. By having these items readily available, you can help your dog to feel more at peace overall. If you’re not comfortable with sectioning off a part of your home, you will want to commit to cleaning regularly. Organizational experts claim the best way to keep a space from being cluttered is to designate a home for everything and spend at least 30 minutes cleaning every day. A handheld vacuum is a great option for reaching inaccessible spaces, and it’s light so you won’t have to lug it around. When you have a dog, things will get scratched, chewed, and worn out. Know how to make common repairs and do so quickly before the issue gets worse. For instance, if you have an antique table or record player that gets up close and personal with paws and claws, you may be able to DIY a coverup for the blemish by using tea, crayon, or coffee. Most antique furniture is made of real wood (versus engineered materials) and should buff out nicely. Even if you can’t hide it, know that each imperfection becomes part of that piece’s history. You should also keep an eye on your rugs, walls, floors, and doors and mend and repair ASAP. Rather than vacuum everyday, there is an easier way to get rid of the dog hair—The Roomba. If you’ve never had the joy of seeing one operate, imagine a circular disk that moves around everywhere on its own sweeping up dirt, dog hair and all of the other dander from your carpet and hardwood floors. The best part is that it actually saves you time, so as you need to focus on other areas of cleaning, the Roomba takes care of all of your floors. Talk about efficiency! Aside from vacuuming, having a lot of dog spray on hand is also critical. Whether your dog has an accident or there’s a lingering pet odor, neutralizing sprays have the capability of eliminating most stains and smells. If you want a beautiful home, this is a must-have item. Provide your pooch with fun toys. Dogs pretty much love all toys, but there are a few specific ones that can provide entertainment for hours. One toy that you can’t go wrong with is the Kong. The Kong can be filled with peanut butter and other delicious treats, keeping your dog engaged for as long as it takes to finish the tasty surprise stuffed inside. Beyond the Kong, there are several other excellent choices including the Shuffle Bone Dog Puzzle, which also offers surprise treats and other treat-dispensing toys. Another approach is to opt for a blue toy. Research shows that dogs are red-green color blind, so naturally having an item that’s blue, especially to contrast with something like green grass, is the best the color of a toy to have around. Hire a dog walker. Having a dog walker stop by once or twice a day to walk your dog while you’re out, will no doubt lift your dog’s spirits. It not only keeps Fido from being cooped up in the house all day but it also affords you with a relaxed mind, providing you have a long work day to finish or want to enjoy an evening with friends. According to PetCoach, the key to an alert and active dog mind is venturing outside. Your dog needs the sights, sounds and smells. After all, it’s an exciting place to explore. Get a pet sitter. By nature, dogs are social. Whether it’s hanging out with other dogs, or being around people, dogs need the opportunity to enjoy the presence of others. Unless you have a job that welcomes your dog with open arms, consider hiring a pet sitter to keep your dog company more regularly. Hiring a pet sitter also maintains the ability to follow a routine. Unfortunately, when everyday life conflicts with what your dog needs, a routine can fall by the wayside, causing stress and anxiety to the surface. Having someone to look and care for your dog, when you can’t, will keep all of this at bay. Having both a beautiful home and happy dog both require work. The secret weapon to obtaining both is intention. As the saying goes, if there’s a will, there’s a way. Nice article. I saw lots of information here. Great job!! !